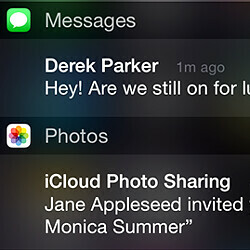 The freshly-released iOS 9 now allows you to ungroup the default alerts in the notification center from their app-centric display, to a more convenient chronological order. Ever since the Notification Center was concocted a few iOS editions ago, it displayed the alerts grouped by the apps they originated with, splashing your screen with redundant Gmail messages, for instance, while you were looking for the latest text message there to preview. 3. Turn off the "Group by App" slide switch, and your notifications will be rearranged from the app grouping order you see in slide 2, to the chronological order in slide 3.
iOS 9 is automatically set to the new chronological order. I prefer group notification as chronological order confusing me.